Pop-up menu of a column. Status/navigation bar at the top of the tabular report. This bar displays the number of records (rows) that have been retrieved. It also enables you to navigate among report pages. Another way to achieve the same styling result is to include WebFOCUS StyleSheet code in the tabular report procedure, as described in Styling the Pop-up Menu and Status/Navigation Bar Using WebFOCUS Code. The following image shows a styled pop-up menu and status/navigation bar. This procedure describes how to style the pop-up menu and status/navigation bar of a tabular report. It supplies sample values, but you can substitute your own values to achieve the desired result. Select the Report menu option, followed by Format. The Report Options dialog box opens. 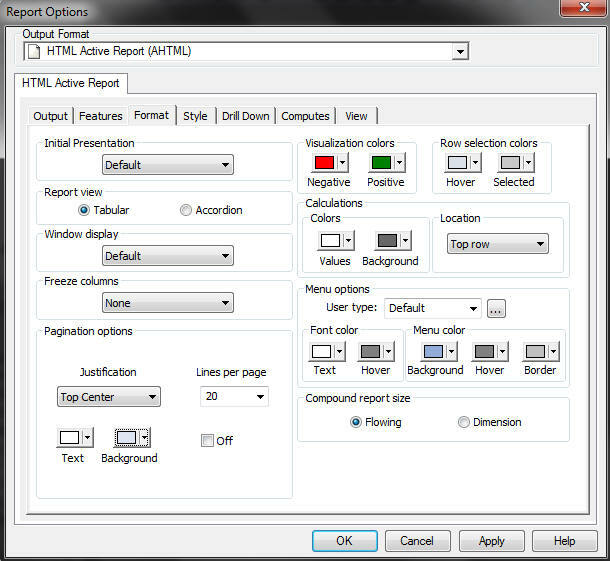 HTML active report (AHTML) is selected as the output format. In the Menu options section, open the Background color palette under Menu color. On the color palette, click Custom. Type either the HSL (hue, saturation, luminosity) values, or the RGB (red, green, blue) values, as follows. For HSL, type 146, 120, 172. For RGB, type 147, 172, 219. Change the menu Hover color to dark gray (50%). Change the menu Border color to light gray (25%). Change the menu font Text color to white. Change the menu font Hover color to dark gray (80%). In the Pagination options section, set the Text color to white. For the Background color, click Custom. Type either the HSL values or the RGB values, as follows. For HSL, type 146, 120, 172. For the Justification under Pagination options, select Top Center from the drop-down list. The following image shows the Report Options dialog box, with the selected sample values. Run the active report to display the newly styled pop-up menu and status/navigation bar. You can add the following StyleSheet code to the end of the tabular report procedure instead of performing the steps in How to Style the Pop-up Menu and Status/Navigation Bar of a Tabular Active Technologies Report. The code produces the same styling result that the steps produce.